Discover the trends and ride their popularity to attract and retain more diners. Over the years, Vietnam has seen its fair share of trends. From the massively popular bubble tea, to more delectable choices such as macarons, cronuts and even kale. While trends come and go, as a chef it is helpful to stay ahead of the latest dining trends to stay relevant to your customers. The following are 4 restaurant trends that are changing the way people eat out in 2017. Take note and incorporate these into your restaurant if you wish to stay ahead of the competition. As Vietnamese people grow more health-conscious and become increasingly aware of what we put into our bodies, previously “Western-dominant” trends such as paleo and gluten-free diets have become increasingly popular. In response, local restaurants have begun including healthier choices on their menus that go beyond the introduction of a few salads. Vegetable-driven cuisine is quickly finding its place in menus, as greens take centre stage in 2017. Not only do greens pack a nutritional punch, they are also extremely versatile. In turn, chefs across the island are realising and responding to the higher demand for vegetable-based menus. While there will always be a demand for meat, the green trend is rising to prominence. Challenge yourself to make vegetables the star of your next dish, or create a meatless dish that is not only delicious, but compatible with wine too! Technology… there’s an app for that! The benefits of technology have been far-reaching, even influencing the way diners eat out today. Technology is pretty much doing everything except creating the dishes and putting them in our mouths. Today, diners are able to order their food and pay for it, all from their smartphones! In some restaurants, diners may even pre-order food so that by the time they reach the restaurant, their meal is ready. These advances have a significant impact on the kitchen as well, as chefs now plan meals that begin even before customers have stepped into the restaurant. If you are a restaurant owner, embracing these technologies to give your diners more convenience and options can give you a huge leap over the competition! Restaurants seem to have rediscovered oysters. As bays and basins are detoxed, farmers are finding new oysters beds while reseeding old ones, bringing oyster prices down. Oysters are replacing chips and pretzels at the tables and some bars are even able to keep the booze flowing with low-cost oysters. These are sure to attract the expanding group of the young and well-off, and is something to keep in mind for your restaurant. 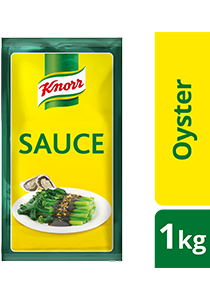 Made from oyster flavoured extracts, Knorr Oyster Flavoured Sauce makes stir-fries more delicious, with a well balanced and natural colour. Ugly root vegetables such as parsnips and celery roots are gaining popularity in restaurant kitchens. One main reason is that customers have no idea how to cook them, thus making them the perfect “cheffy ingredients”. Seaweed might not take off like kale, but it’s an all-time favourite among consumers and chefs alike. It’s a hit among consumers as a snack, and chefs are now adding them to their seafood sauces, broths and even risotto. After witnessing the rise of the Greek yogurt, we think hummus is not too far behind. This niche product is no longer consumed by mainly Arab and Israeli expats. In fact, hummus has already out-trended salsa in Western countries, and may do the same here in Vietnam.